Would you make a good receptionist? Take our career test to find out how you match with this and over 800 other careers. What is the workplace of a Receptionist like? A receptionist (sometimes referred to as an administrative assistant) is someone who performs various administrative tasks, including answering telephones and giving information to the public and customers. Receptionists are often the first employee that the public or customer has contact with. They are responsible for making a good first impression for the organization, which can affect the organization's success. Although some tasks are common to most receptionists, their specific responsibilities vary depending on their work establishment. 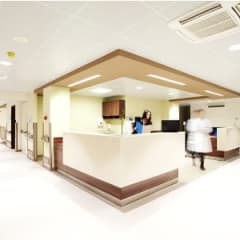 For example, receptionists in hospitals and in doctors' offices may gather patients' personal and insurance information and direct patients to the proper waiting room. In corporate headquarters, they may greet visitors and manage the scheduling of the board room or common conference area. In beauty or hair salons, they arrange appointments, direct clients to the hairstylist, and may serve as cashiers. In factories, large corporations, and government offices, receptionists may provide identification cards for visitors and arrange for escorts to take visitors to the proper office. Those working for bus and train companies respond to passengers’ inquiries about departures, arrivals, stops, and other related matters. Receptionists use the telephone, computers, and other electronic devices. Despite the widespread use of voicemail or other automated systems, many receptionists still take messages and inform other employees of the public’s or customers’ arrivals or cancellations of appointments. When they are not busy, receptionists are usually expected to help other administrative employees by doing a variety of office tasks. Are you suited to be a receptionist? Receptionists have distinct personalities. They tend to be conventional individuals, which means they’re conscientious and conservative. They are logical, efficient, orderly, and organized. Some of them are also enterprising, meaning they’re adventurous, ambitious, assertive, extroverted, energetic, enthusiastic, confident, and optimistic. Does this sound like you? Take our free career test to find out if becoming a receptionist is right for you. Although receptionists work in almost every industry, many are concentrated in healthcare and social assistance, including physicians' offices, hospitals, and nursing homes. Receptionists who greet customers and visitors usually work in areas that are highly visible, clean, well-lit, and relatively quiet. Most work in a comfortable office setting. The work that some receptionists do may be tiring, repetitious, and stressful as they may spend all day answering continually ringing telephones and sometimes encounter difficult or irate callers. Some receptionists, including those who work in hospitals and nursing homes, may have to work evenings and weekends.